In November of 2018, St. Francis College Hosted Their Inaugural Prison Reform Conference. 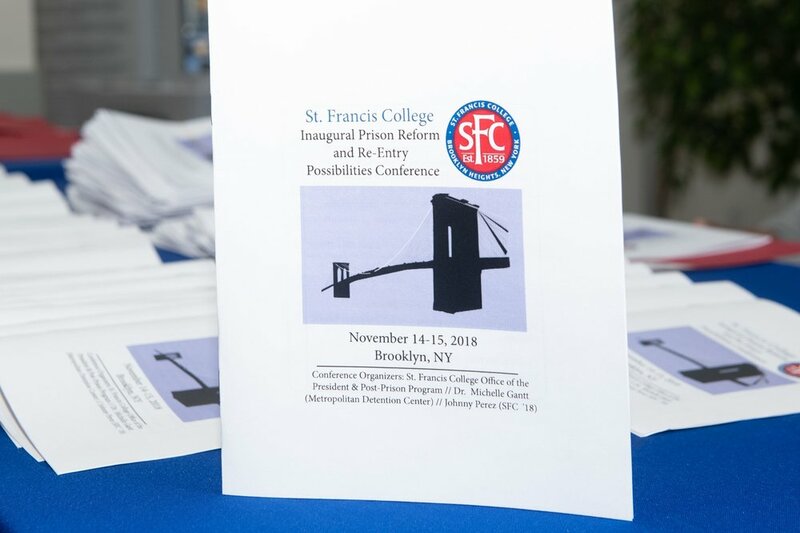 On November 14 and 15, St. Francis College Post-Prison Program welcomed more than 250 guests to the first annual Prison Re-entry, Reform and Possibilities Conference. Politicians, artists, activists, and formerly incarcerated individuals examined topics ranging from the realities of punishment while incarcerated, to the challenges of re-entry after prison. Since 2014, the Post-Prison Program at St. Francis has enrolled 11 students and 3 graduates, giving formerly incarcerated men and women a chance to pursue higher education. Three of the students from the inaugural cohort graduated with their Bachelor’s degrees in 2018. This two-day conference aimed to highlight the achievements of the Post-Prison Program, while examining the moral and religious implications of re-entry programs and raising awareness about the innovative programs for those currently in prison. Keynote speakers included Chris Owens, Director of the Re-entry Bureau at the Brooklyn District Attorney’s Office; Vaughn Mayers, from the Office of Senator Kevin S. Parker; Assemblywoman Latrice Parker; and NYS Assemblyman David I. Weprin, Chair of the Corrections Committee. The conference revolved around a series of panels. The first, moderated by Dr. John Edwards (Associate Professor of Religious Studies, St. Francis College), explored the concept of redemption in religious thought. Panelists included Dr. Jenny Labenz, a Jewish Studies scholar; Debbie Almontaser, a Muslim Educator and Founder of Bridging Cultures; Rev. Barbara E. Davis Executive Minister at First Presbyterian Church in Manhattan; and Joshua Stancil, a Catholic activist who was formerly incarcerated. Panelists discussed how their own religious traditions offered room for understanding and critiqued the judicial system for failing in this area. The second discussion focused on the St. Francis Post Prison Program. The panel featured current students enrolled in the program– Steuben Vega, Kevin Smith, Luis Pelaez– and Felix Colon, who graduated from St. Francis in May. The students all spoke of the challenges of prison, and how attending St. Francis offered them not only an education and degree, but support, mentorship, and social networks during the challenging re-entry process. The panel was moderated by Keston Jones, a formerly incarcerated person currently pursuing a doctorate at Yeshiva University and founder of the Foundation for the Advancement and Rehabilitation of the Marginalized. The final panel of the day, moderated by conference co-organizer Dr. Michelle Gantt (Education Supervisor of the Metropolitan Detention Center) discussed the importance of education programs within prisons. With input from Dr. Christa Mercer of Columbia University, K. Bain of Cure Violence, and Nick Franklin of the Brooklyn Public Library, panelists discussed how education programs can be transformative for incarcerated men and women. In addition to panel discussions, there was a screening of the documentary film Cooler Bandits, and a performance by Theatre for Social Change. One of the most powerful aspects of the conference was a full-size replica solitary confinement cell and virtual reality experience coordinated by Johnny Perez (SFC ’18) of the National Religion Campaign Against Torture. Doug Van Zandt of the New York Campaign for Alternatives to Isolated Confinement, constructed the cell onsite in Callahan Center and offered tours of the cell, along with Felix Colon (SFC ’18). This Conference was hosted in partnership with the President’s Office of SFC, and in collaboration with Dr. Michelle Gantt of the Metropolitan Detention Center and Johnny Perez, SFC ’18, National Director of Prison Programs at the National Religious Campaign Against Torture.